Alex Mogylewski, 13(9)-9(6)-0, is now the official opponent of Firat Arslan at Super Fight Night in Düsseldorf at Saturday 01.12.2012. At http://www.ran.de beginning at 19.30h (CET) with fights from the undercard. The boxing expert (at TV2 Fight Nights) and coach Brian Mathiasen is convinced of a victory of Mikkel Kessler. It will not be an easy fight against Brian Magee. Brian Mathiasen is the coach of Reda Zam Zam, who is even fighting at 08.12.2012 in Herning. Charr vs Airich at 21.12.2012 in Cologne, update fightcard with Foreman,Altunkaya! The X-mas Fight Night in Cologne, Germany, at the 21.12.2012 is the main fight Manuel Charr vs Konstantin Airich. The event will have a fightcard of six bouts. Firat Arslan will be fighting at the Super Fight Night in Düsseldorf at 01.12.2012. As the opponent of Ruslan Chagaev the in Ireland living Mike Perez got injured, it was named a new opponent with Yakup Saglam. Now it seems that Ruslan will not be fighting at Saturday and Sturm Promotion has now engaged Firat Arslan, cruiserweight, to fight! New bout Firat Arslan vs Alex Mogylewski. 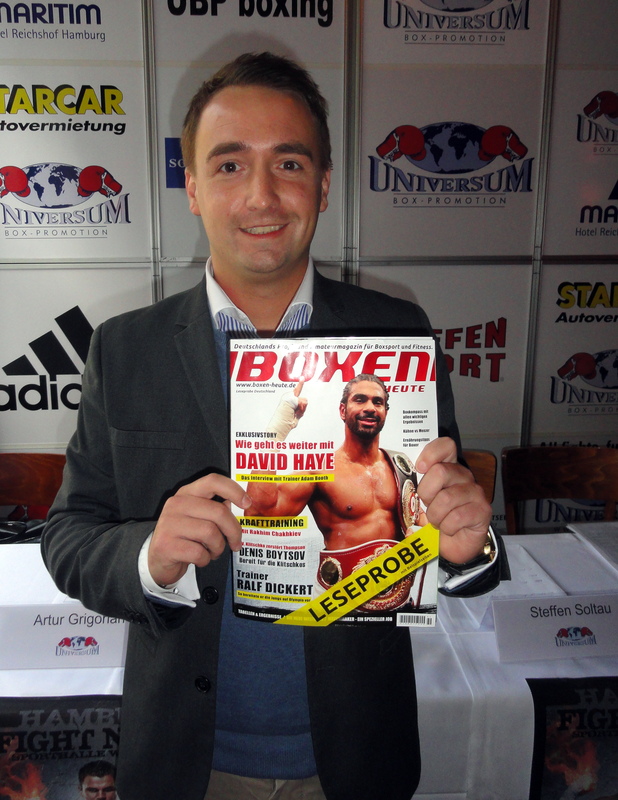 Steffen liest BOXEN HEUTE! Du auch?